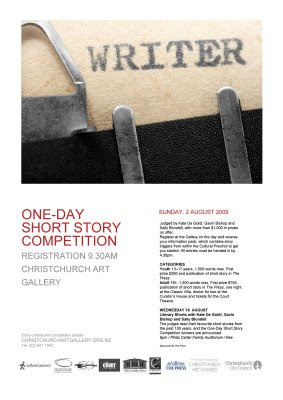 Writers around Christchurch will be digging out their pens and infusing their creativity as they are offered the chance to take part in the One-Day Short Story Competition next week. Christchurch Art Gallery, Christchurch City Libraries, The Cultural Precinct and the NZ Society of Authors have come together to host the event, which is part of the 150th anniversary of public library service in Christchurch. On Sunday 2 August, adults and youths are invited to Christchurch Art Gallery to collect their competition packs, containing a list of 12 exciting features in the cultural precinct, competition instructions, a map of the cultural precinct and a blank CD. To take part, participants will need to follow their maps around the cultural precinct, visiting different highlighted features. They must then write a short story, to a maximum of 1500 words that incorporates at least four of the distinctive features visited. Entries must be submitted on CD, and returned to Christchurch Art Gallery by 4pm the same day. The competition includes two entry groups, youth aged 13-18 years and adults aged 18 upwards. The winner of the youth category receives $250 and their winning story published in The Press, while the winning adult receives $750, their story in The Press, one night at Classic Villa, dinner for two at the Curator’s House and tickets for the Court Theatre. The one-day short story competition will be judged by well-known authors Kate De Goldi (winner of the 2009 New Zealand Post Book of the Year Award), Gavin Bishop (renowned children's book author and illustrator, who recently set up the Storylines Gavin Bishop Award) and well-known author Sally Blundell. The winners will be announced on Wednesday 19 August at the Philip Carter Family Auditorium, Christchurch Art Gallery, as part of the free Literary Shorts event. The two posters, side by side. 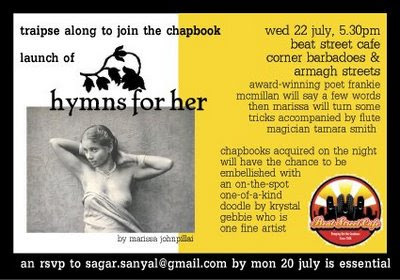 Love Letters in the Margin is a performance by 3 poets and 3 bands - poetry powered by songs powered by poetry. 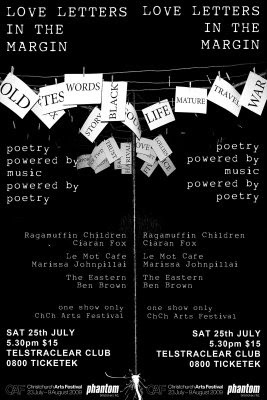 Featuring the poetic prowess of Ben Brown, Marissa Johnpillai and Ciaran Fox paired with the musical muscle of The Eastern, Le Mot Cafe and Ragamuffin Children. The show features on the opening weekend of the Christchurch Arts Festival as part of the Wintergarden programme. Hear Ciaran talk about the show on Plains FM. A limited edition CD and programme will be available for sale at the show featuring a recording of a live-to-air broadcast show from Lyttelton's Volcano Radio which includes live performances from the poets, and songs from the bands. 1 day to write a story based on a choice of the triggers provided by the Gallery. First prize $250 and publication of short story in The Press. First prize $750, publication of short story in The Press, one night at the Classic Villa, dinner for two at the Curator’s House and tickets for the Court Theatre. 9.30am: Register at the Gallery and get an information pack, which includes four of the twelve story triggers from within the Cultural Precinct to get your story started. 4.30pm: Entries handed in (late entries will not be accepted). With introductions on the night by this year's winner of the open section in the NZ Poetry Society International Competition, Frankie McMillan, who's launching her own latest collection next month and live music by flautist extraordinaire Tamara Smith (Mundi) plus some words by the author herself - should be fun times. Marissa can also be seen in the upcoming, not-to-be missed live poetry/music salon Loveletters in the Margin as part of this year's Christchurch Arts Festival Wintergarden programme in the TelstraClear Club. Stay tuned for more info on this amazing one-night-only performance but if you can't wait check out the info here.